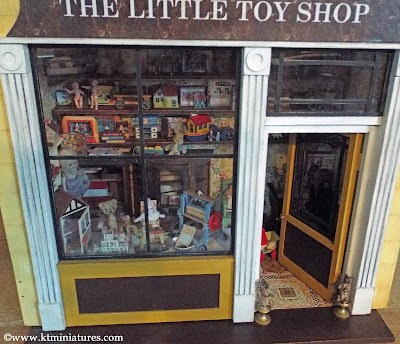 My New Project - The Little Old Toy Shop! As promised, I can now show you images of my new "old" project which at long last is looking a little more presentable....and which is from my own private collection. 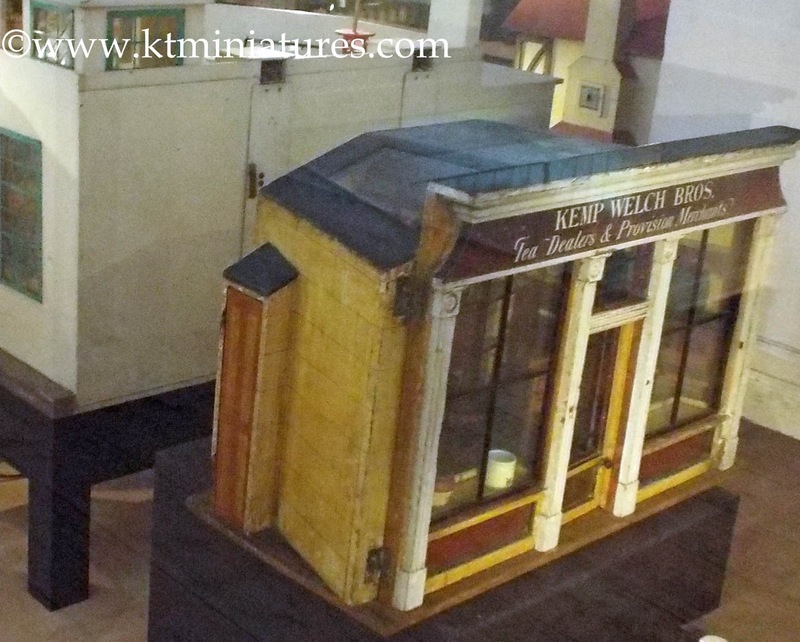 It all began back in October 2014, when on a visit to the Museum Of Childhood (Bethnall Green - London) with Robin my workshop colleague, we first came across this stunning large scale shop - as seen above. 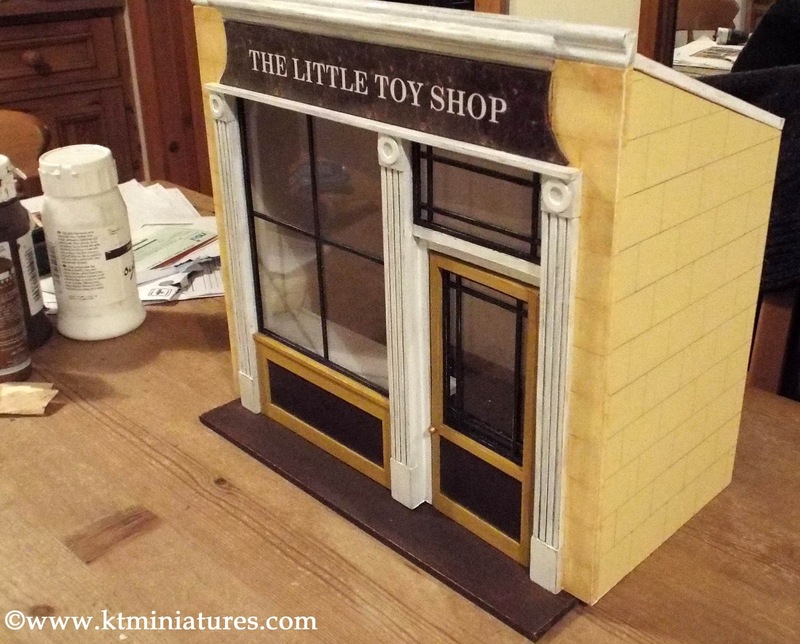 We were immediately taken with the muted colouration of the brick exterior and the unusual construction of the shop front - it was beautiful and quite fascinating. Throughout our museum visit, I found myself continually drawn back to that shop and ended up sitting on the floor next to it, scribbling notes and making quick sketches! I was totally smitten, so too Robin and we decided it would be fun to have a go at making something in the same vein. 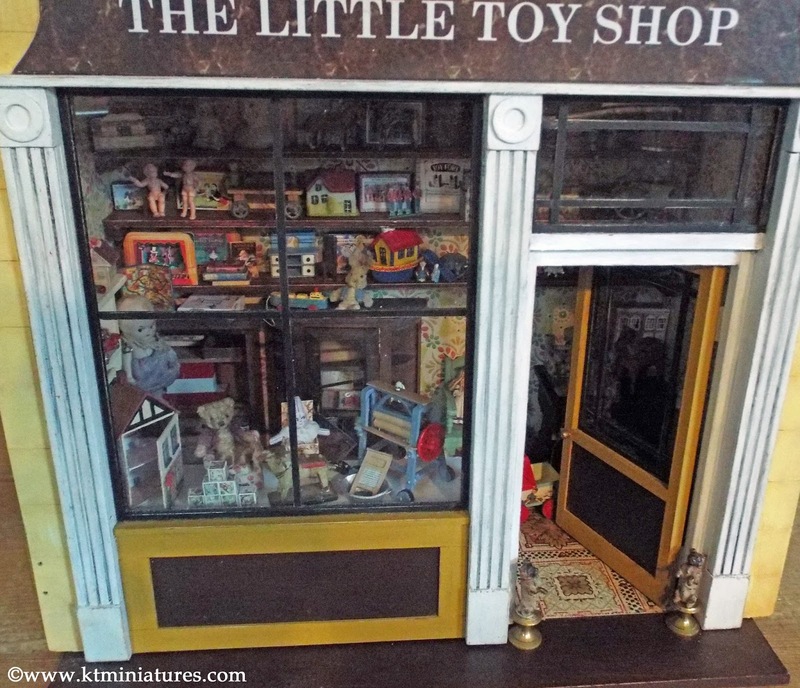 After experimentation with design, colours and materials, this was the result - "The Little Vintage Toy Shop" and it became our Nostalgia In Miniature Workshops project for 2015. 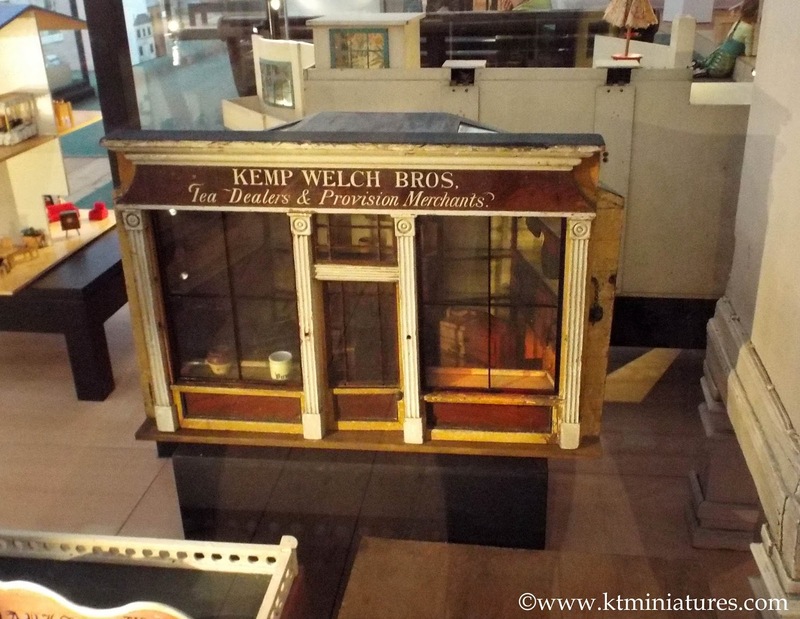 As you can see, it was greatly inspired by elements of that beautiful miniature shop we saw in the museum. A whole variety of miniature vintage style toys were also part of the workshop project, mainly based on the 1920s-30s era. When the workshop was over it was decided that I would keep the project prototype (Robin no longer collects 1/12th scale projects so she was happy for me to have this) and thus fulfill plans that I have had for a long time to create a little old shop that could house my many miniature toy related "bits" that have been collected over several decades. 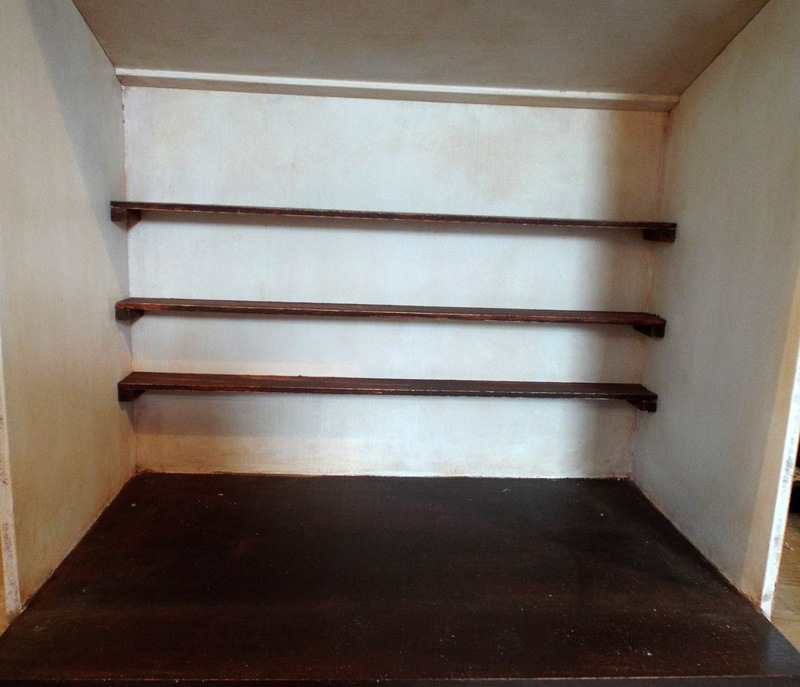 My first task was to carefully remove the shelves that we had fixed across the back for the workshop. These were then put aside to be used later. 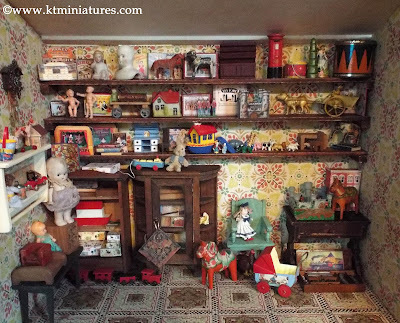 Followers of KT Miniatures will know that I've been selling antique wallpaper for years now and to me every piece is precious, no matter how tiny, consequently no remnant is ever thrown away! 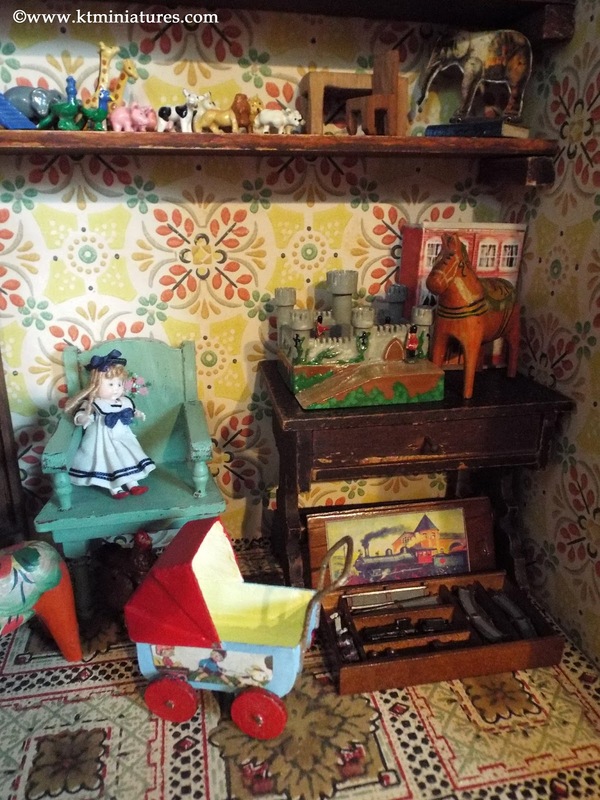 So from my "scraps" I chose to cover the walls with some gorgeous brightly coloured wallpaper - it is difficult to remember how old that particular pattern is as I have had it for so long, but I think it originated from the 1920s/30s? 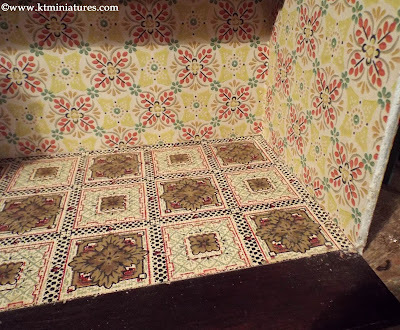 The floor was covered with a small remnant of early 1900s antique wallpaper - ok it was ripped and marked in places but these could be disguised or hidden, and I just knew this precious scrap would be useful one day. It fitted with about 1cm to spare (phew)...I think it was just meant to be! I know it's not everyone's "cup of tea" to mix patterns, but I love experimenting and was delighted with the effect of the floor and wallpaper together. The shelves were put back in place across the back wall, hinges were put on the frontage and all my bits and pieces were hauled out of boxes and dark places where some had been for years (I kid you not)! And now here it is in all its glory at this present time, but of course it will change and develop over time as more contents are added. The plan is that when I have run out of existing shelf space, I will simply fix more shelving to the side walls and across the window. But for now, this will do! As you can see, the contents greatly vary. 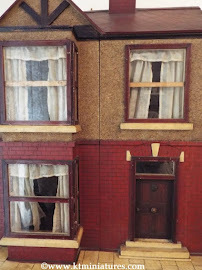 There are a good deal of my own handmade 1/12th scale replicas such as a Tri-ang Stores, c1930s Theatre, packaging, etc. The boat on wheels was the brainchild of Robin, who created this as part of the workshop project and based it on her husband's childhood toy. 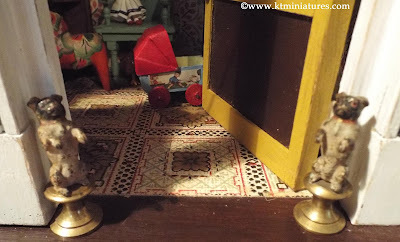 The house is an antique cake decoration and the truck on wheels I believe to be an antique Erzgebirge cart. For details of the gorgeous rabbit, please see further down. 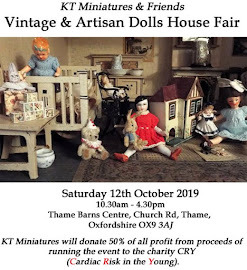 The tiny dolls on the far left of the middle shelf were originally sent to me as the owner no longer wanted them and thought they could be useful to me (how lovely is that), so I made a donation to the Breast Cancer Now charity for these. I intend to paint their clothes and features one day. 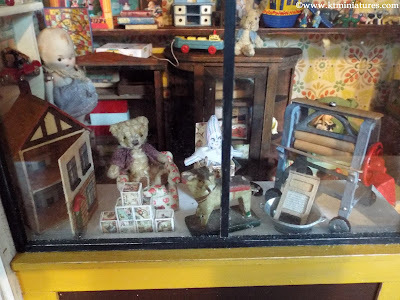 I hope to eventually house some real special tiny delicate items in the semi glazed antique German cupboard but there is not much in there at the moment, only an old KT Miniatures handmade vintage style Magic Sets - made many years ago now. 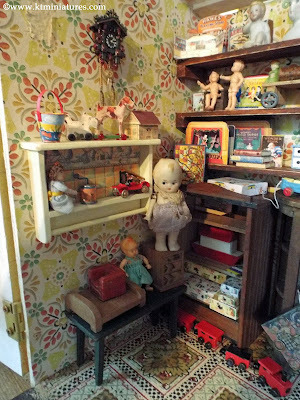 On the upper shelves are more handmade pieces, plus an antique brightly coloured tin, a wooden tree from an old German model village, a vintage miniature Dinky metal postbox, a wooden dresser from the c1920s/30s Bertha (Penrose) & Ralph Wright Collection, and a curious antique celluloid horse and cart. 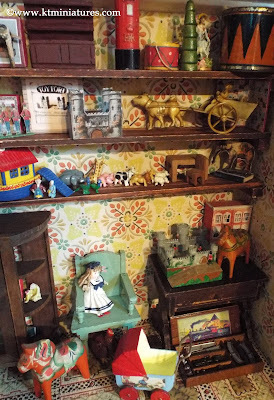 The brightly painted Warwick Miniatures Noahs Ark and animals I was given as a present over 20 years ago...I love it but have had nowhere to put it all this time so it has sat in a tin for years, would you believe! In addition to the shelves, I have used a variety of antique and vintage furniture to stage yet more contents. There is a battered old table in the far right corner with a Pheonix painted metal castle and fixed handpainted soldiers, an antique wooden painted horse, a handpainted metal train set in a beautiful wooden box that I acquired a long time ago and which has also sat in a tin for years! The little green German dark varnished chair had originally been broken right across the back but I decided to salvage it by gluing it back together, filled in the unsightly crack and painted it in a pale green colour. As a final touch, some teeny flowers were handpainted on the back. 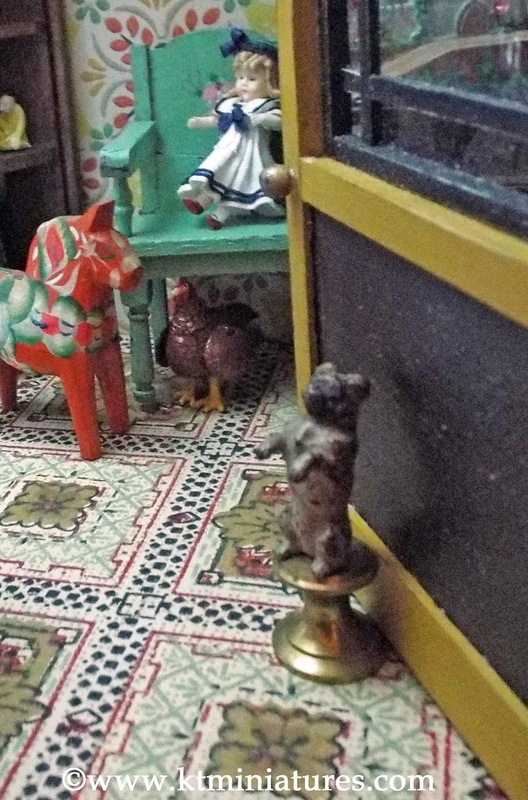 A beautiful doll that I acquired from an overseas artisan I came across at last year's Kensington Dolls House Festival (but sadly can't remember her name-oops) is quite at home on the now pretty chair. 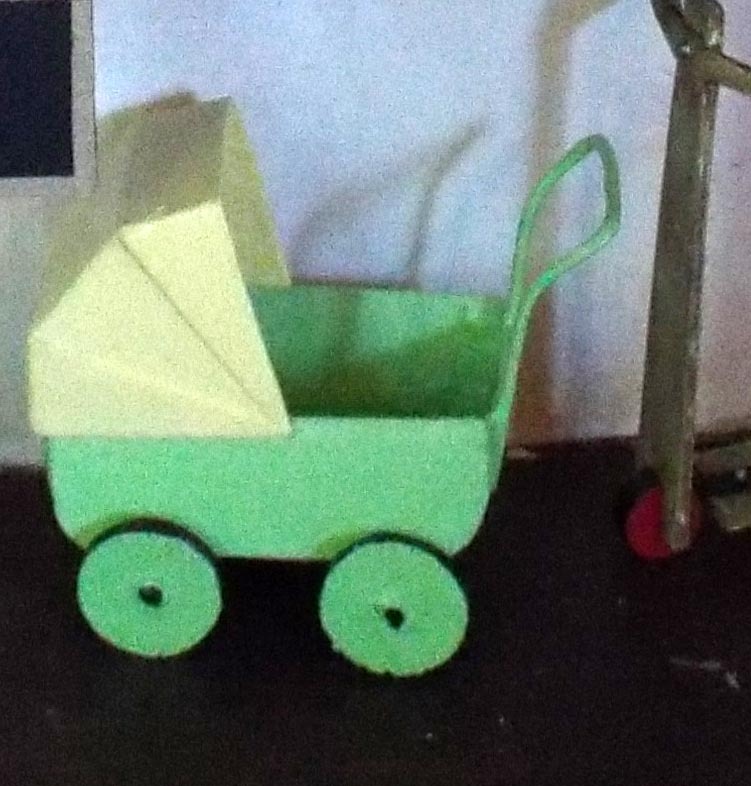 The pram was part of the workshop project and had been created in green and yellow card. 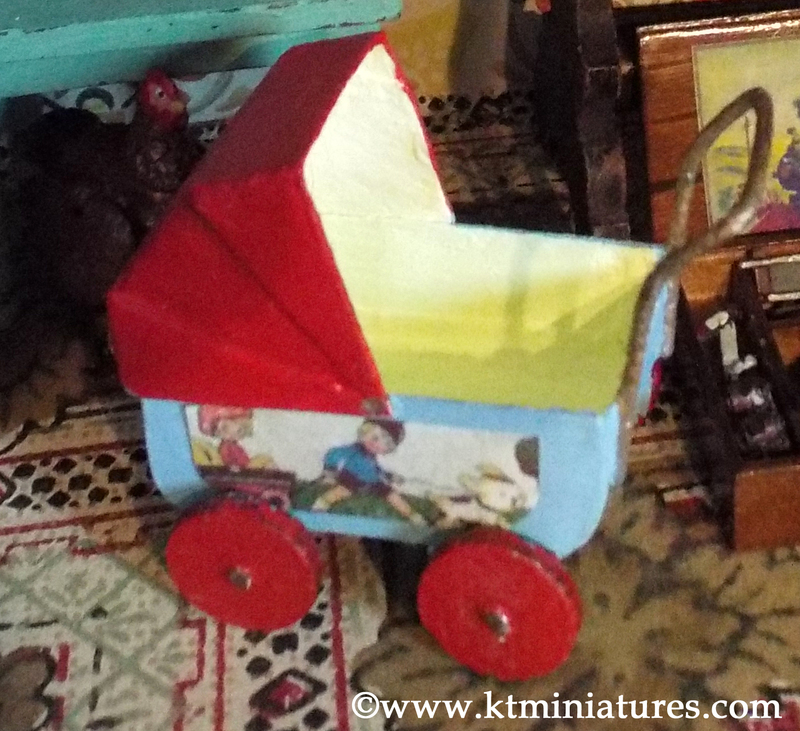 However I decided to give it a blue and red finish with yellow interior, then fixed a nursery image to the side. On the lefthand side of the interior is one of my KT Miniatures handmade vintage style "kitchen" shelves fixed to the wall but I think it is perfect in the shop setting. 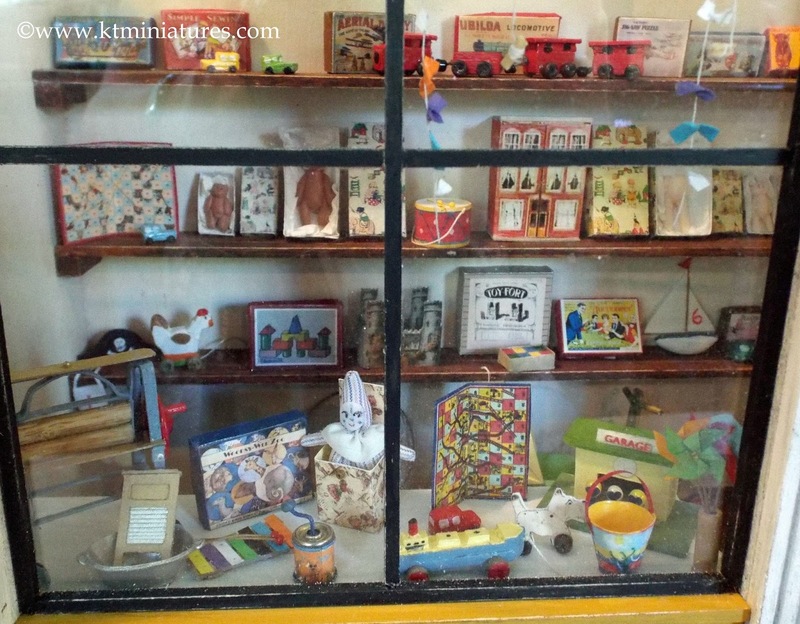 It is filled with an array of handmade and vintage pieces, plus a metal cuckoo clock is fixed above. 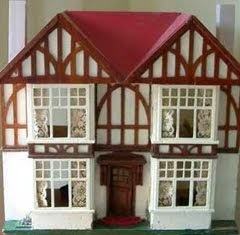 The clock I acquired with an old dolls house but I don't know its maker and doubt if it is really that old. Underneath is an old green bench with more of Bertha (Penrose) & Ralph Wright tiny wooden furniture, a 1930s Japanese bisque doll sits on top of a weeny antique inlaid Japanese chest. In the corner is an antique cupboard that is missing its door, filled with old style packaging and a c1960s Tri-ang Noahs Ark. The little dolls house in the window is a KT Miniatures handmade item, along with the antique style bricks. 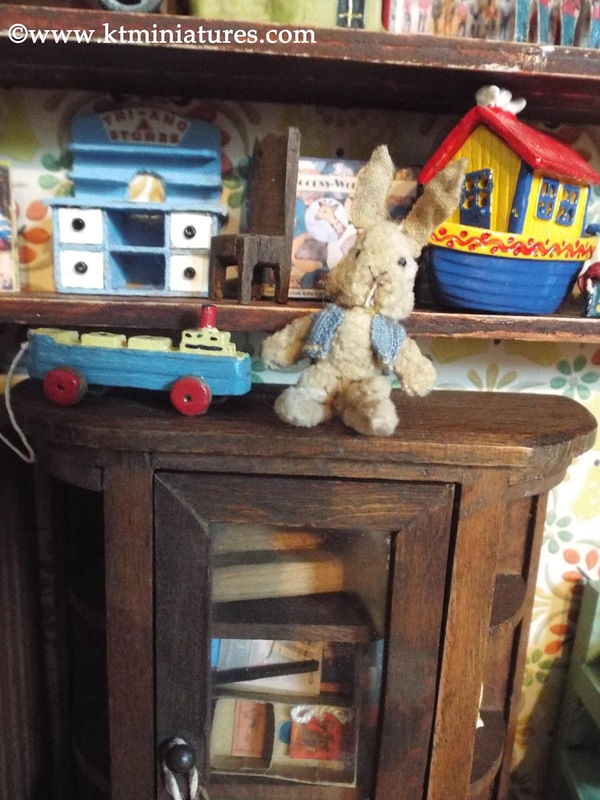 The wooden animal is antique - probably Victorian. The Jack-in-the-box was one of the workshop toys, so too the magnifcent replica of the Tri-ang mangle, washtub and scrubbing board (more of Robin's handiwork)! 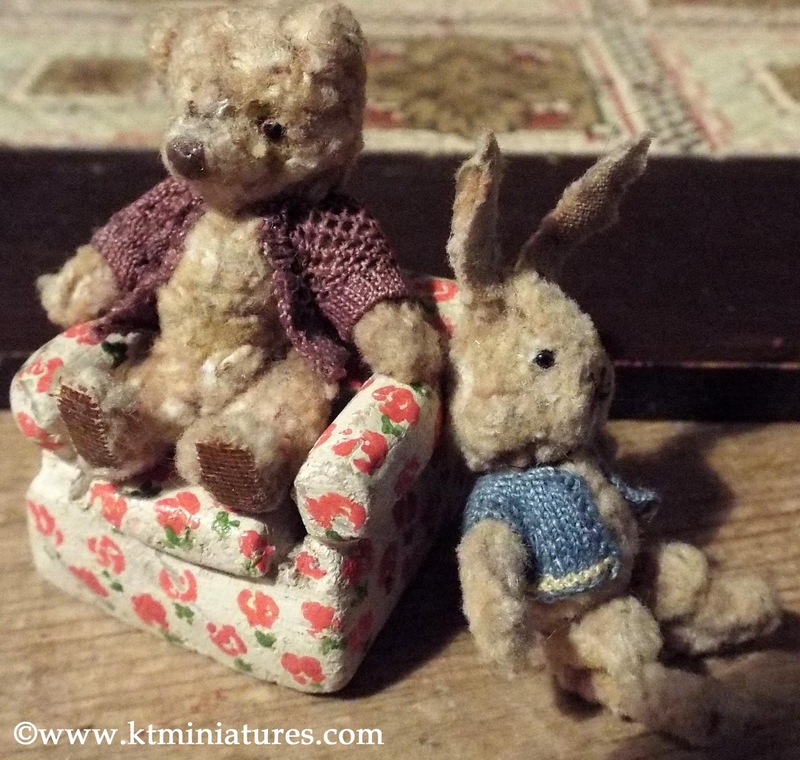 The teddy bear is a real favourite of mine and he is sitting in a rare gorgeous handpainted sculpted chair by Bertha (Penrose) & Ralph Wright....see more about him below. A bit whacky I know, but if you look carefully under the chair you might be able to see a glimpse of Daisy, the metal painted chicken - another item that came with an old dolls house. Daisy isn't very old and I don't know who her maker is but she just makes me smile. And finally, these c1910 Viennese cold painted bronze dogs fixed to brass pillars, stand guard at the shop door and look rather splendid, don't you think? Well that's it for the moment...I do hope that you have enjoyed taking a peek at this project. 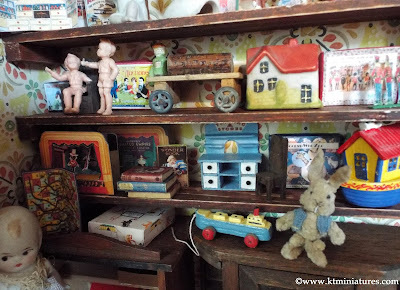 It is a bit of a crazy project in which anything goes and I am just going to collect any antique/vintage or handmade vintage style toy related item that I take a fancy to...pure indulgence! As it progresses I hope to visit it on here again, perhaps. 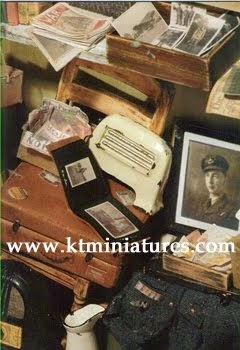 New KT Miniatures Website Now Up And Running! 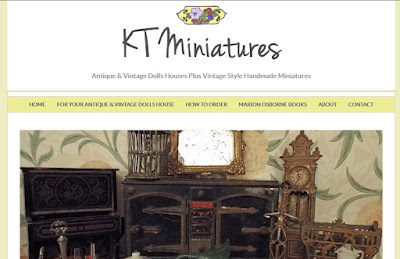 Am delighted to announce that KT Miniatures' brand new website is now up and running. Quite different to anything I have had before and hopefully it will be much easier to use, particularly on mobiles and tablets too. For the first time ever, I have incorporated all the KT Miniatures handmade vintage style miniatures within the same sections as the antique and vintage items, resulting in a far more compact website. 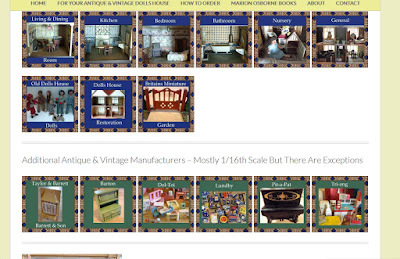 The handmade items are clearly listed so there can be no confusion with the genuine antique/vintage items. Am also hoping to include more salvaged pieces over time, similar to the chest of drawers featured on KT Miniatures Journal in an earlier post. Also I have kept six of the more well known vintage manufacturers with sections of their own. 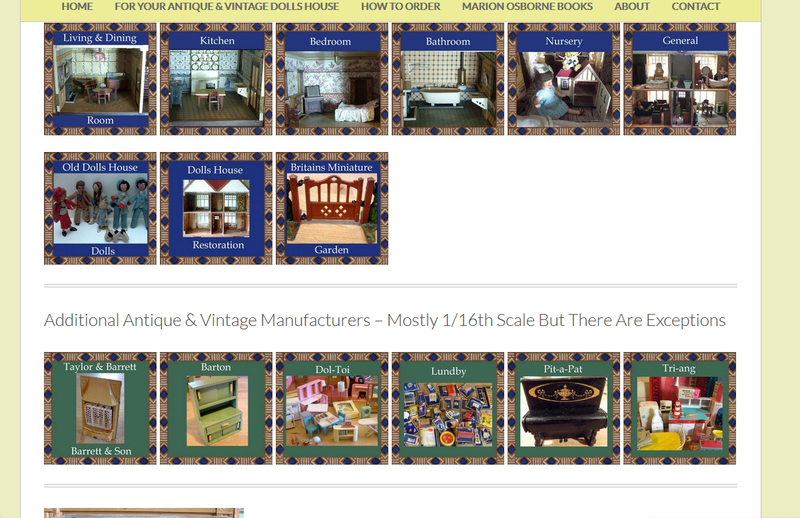 And finally, at the foot of the Home Page, there will be a sliding pictorial bar with relevant links, of the most recently listed items, so that you can see instantly at a glance.